First off, Score really made some great cards in 2009. This card is an excellent example of great design integrated with current trends. Furthermore Panini really had a nice look to this card and didn’t shirk on the player photo showcasing Arian in his college duds. So when I talked about getting player’s autographs, half of the charge of getting current ones is when it is a player who is a no-name rookie who has a ho-hum first season, (when I get their autograph) and then they crank it after that. Arian Foster is a great example of this. Foster was near the top of draft boards as a junior, but elected to stay an additional season at Tennessee. Foster was billed as a runningback in the vein of Travis Henry but an injury plagued senior season complicated by an overall bad season for the team, sent Foster’s stock plummeting. 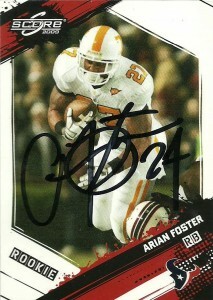 The 2009 draft went by and Foster’s name was not called. Undaunted he signed a free agent contract with the Texans over the Saints- theorizing the Texans, (under his girlfriend’s guidance), gave them the best chance for him to play. By the time the dust settled after training camp, Foster was released and resigned to the team’s practice squad. He’d remain there through most of the Texans’ 2009 season. In the meantime, the team struggled on the ground and especially in the redzone. The Texans attempted a variety of different players including Steve Slaton, Chris Brown and Ryan Moats, but were unable to really get the ground game going. But as Foster was going to the airport on Week 14, he heard on the radio that he was being promoted from the practice squad for the next game and would on special teams against the Titans. Arian would quickly move into the starting lineup as runningback helping the team establish more consistency in its ground game running for 100 yards in each of the contests he started to finish his rookie season. While I was initially skeptical of his sophomore season in 2010, Foster proved me wrong by breaking the team record in rushing yards opening day cranking out 231 yards on the ground en route to the team’s victory over the Colts. (It would be the second highest rushing effort on opening day in NFL history behind OJ Simpson’s 250 yard effort.) He continued his attack on the rushing books and has now the longest carry in team history with a 74 yard gallop. He also owns most other team records in the books including touchdowns in a season and rushing yards. At the conclusion of the 2010 season, Foster finished as the league’s leading rusher with 180 yards against the Jags, and was named to his first ProBowl. Arian also shattered Priest Holmes record for most yards rushing by an undrafted free agent with 1616 yards rushing- and chipped in an additional 600 yards receiving. Some call Foster eccentric. His middle name is Aquarian. Arian also likes to write poetry and when he scores a touchdown and puts the ball down bowing to the crowd. Admittedly Foster was amazed at how fast things changed for him when he took the starting job in 2010, however he has endured to remain humble about the whole experience. Below are his stats through the 2010 season.